Just a few of the cards sent by friends and relatives. God bless you all. I am now 65. I know reaching 65 is very meaningful to many people and to others it is just another birthday. No big deal. 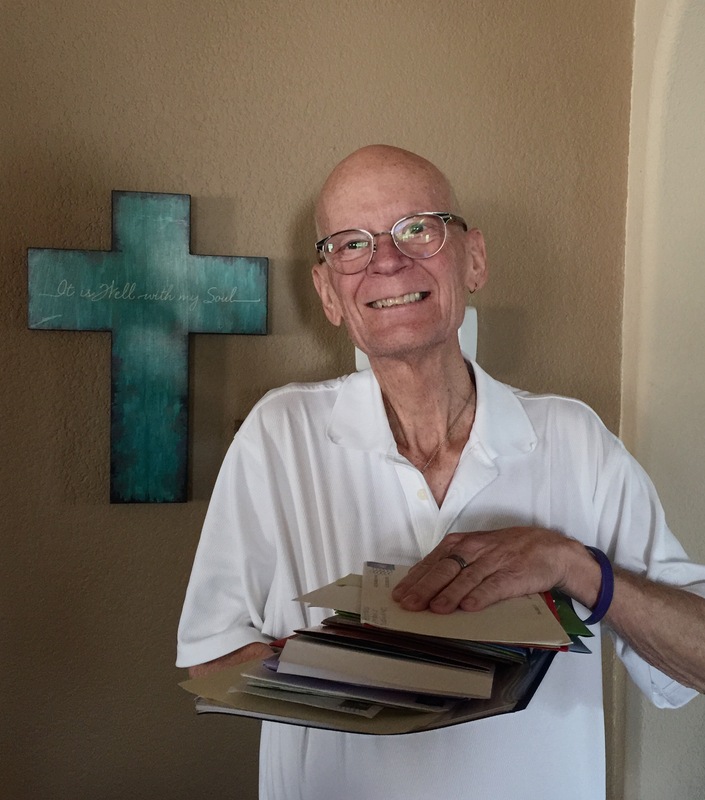 I have pancreatic cancer and for some time now, I have celebrated every day as a birthday. When I turned 57 Patti threw me a birthday party to end all parties. To this day I remember fully the hangover I had the next day. But even with a headache, just waking up the day after I reached 57 was such a blessing. The men in my family were mostly smokers. Most of them died of heart-related reasons. Certainly, the smoking didn’t help. For me, every day that I get to wake up and spend time with Patti is the most spectacular day of my life and I thank God and His son for their blessings. The picture that goes with this posting is quite remarkable. They are birthday cards from friends and relatives who, unbeknownst to me, were notified by a little birdie (Casey) about my pending birthday. I want to thank all of you who sent cards. One of my former roommates, Richard, sent copies of old photos when I had hair and we spent time together. Also, Mike, a good friend from Maryland, sent a spiral-bound copy of his favorite jokes that he has accumulated over the years. Again, thank you for the cards, well wishes and prayers. I hope you get to celebrate every day as a birthday. God bless you all! Weight loss … or …paracentesis? Whenever I watch TV throughout the day, there are an incessant amount of weight-loss advertisements. Whether Nutrisystems and Marie Osmond, Jenny Craig, or whatever, all trying to get the average viewer to sign up for their weight-loss system. I’m sure some are successful, or they all are. No one seems happy with they way they look on a daily basis. For about the past 3-4 months I have been developing my own weight-loss system. Not that I need to lose any weight at all. In fact, I need to find a way to add some pounds. Getting ready for the paracentesis with my fashionable blue cap. Anyway, from a health perspective, I am back on chemo every other week. I get my gemcitabine and abraxane. Very little side effects. But several months ago, I noticed that I was experiencing a very, very extended stomach/abdomen. From the breastbone up, I looked like a victim from Auschwitz. From the breastbone down, I looked like an 8-months pregnant woman. Well, my oncologist, Dr. Jerry, told me that what I was experiencing was an accumulation of fluids that normally the liver processes and disperses throughout the body for release into the atmosphere. It doesn’t pass through urination. But, as the body accumulates the fluid, there is a weight associated with that buildup of fluids. Dr. Jerry told me there is a process called paracentesis that helps to remove these fluids. The individual goes to the hospital. Nurses and a doc or two there will hook you up to an ultrasound and on the screen they can see about how much fluid has accumulated and where it is resting. They will then decide whether to access the fluids from the left side of a patient’s lower abdomen or the right. I have been to 2 hospitals to have paracentesis. I have had 5 so far. At each hospital, the nurses and doc will tell me the worst case of someone carrying fluid. The common number for the 2 hospitals was 32 liters. Could not freakin’ believe it. The individual would have to be carrying around the weight of 32 liters of fluid before they withdraw it. I was amazed. During my 5 times, I have roughly given off 3.5 liters of fluid on more than one occasion. That’s roughly 5 pounds of weight. I also dispersed 4.5 liters once and we figured it was worth 6.5 pounds. So the day after I have a paracentesis, I feel like I can climb Everest — or at least watch someone on TV do it.. There really aren’t any side effects, except the pain of the puncture for the needle they use to withdraw the fluid. That can be a bit painful. Some people go in weekly to have these fluids removed. My schedule tends to run either every two weeks or every three weeks. Still, I can always tell when I need to get a paracentesis. I feel heavy, my stomach looks more and more like a beer belly and I don’t eat. So maybe this isn’t like those weight-loss programs. With them. the individual hopes the weight goes away and never returns. My weight comes and goes every time I have this procedure done. So, maybe the paracentesis is a lot more like these weight-loss programs than I thought. Some years ago, I heard the term “bucket list” for the first time. I understood immediately what it meant. Since then, several friends and family have shared with the Cancer-Boy what the bucket list means to them. And, to be honest, as a stage-four pancreatic cancer patient, I get asked quite often what is on my bucket list. When Morgan Freeman and Jack Nicholson made the movie “The Bucket List,” I had to see it. I’m worn out with Jack Nicholson, but will go see anything with Morgan Freeman. One of my favorite scenes in the movie is when the two men are sitting atop an Egyptian pyramid and looking out over the desert. While Patti and I don’t talk about bucket lists often, or ever, she pulled one over on me a few weeks ago. She made the following arrangements and surprised me with them. She managed for us to go to the Grand Canyon. Knowing how often I fall, even with my cane or walker … on a flat surface, for a fleeting moment, I thought this may be a life insurance ploy. We flew to Flagstaff and took a cab to nearby Williams, Arizona. At Williams, people can take an old-fashioned train from Williams to the South Rim of the canyon. While on the train, people keep you entertained with skits and comedy, while you look at the spectacular scenery passing by you. Pine trees, wind farms, desert areas and mountainous areas. It was beautiful. Once at the South Rim, as soon as we disembarked from the train, there were motor coaches within a few steps. Their purpose is to take people along the South Rim and make periodic stops at beautiful locations, for visitors to leave the bus, walk for a little and take marvelous pictures. All the while focusing on the safety of the customers. On our day at the canyon, the weather was beautiful — loads of sunshine and periodic clouds. The rails along the paths are perilously close to the canyon cliffs. If someone were so inclined to step over the rail, to the cliff side, it would be a painful death. The trails were occasionally smooth and others were craggy and more of a challenge to someone like me who used either a cane of a walker. At the first stop, Patti and I stepped out and walked to the rail. I lost it at the first stop. Teary-eyed like a new-born. Right in front of my eyes was a true miracle of nature that God had worked on since the beginning of time and, judging by the speed of the Colorado flowing rapidly beneath us, He was still at work. The geographic layers of the exposed mesas and craggy rock formations were truly impressive. Did I want to hike to the bottom? No. Did I have a respect for those who did, or those riding the Colorado in boats? Yes, definitely. Did I enjoy the views from every stop? Absolutely. They were beautiful and incomparable. As we were enjoying the spectacular beauty, Patti and I soaked up just about every site that came our way. Funny thing, though. I never thought of this as a “bucket list” event. Not once. Later that afternoon, we rode the train back to Williams, satisfied that we had been witnesses to such wonder and been affected by it. While we were riding back to Williams, I silently began thinking while I was watching the landscape pass before us. I have had a full life. I have seen loads of national parks, like Yellowstone, the Badlands, Carlsbad Caverns, Devils’s Tower, the Everglades, Pike’s Peak, Rockie Mountain National Park, Mt. Rushmore among others. And, I am thankful for the opportunity to travel when I was younger. I climbed to the top of the Eiffel Tower; saw Napolean’s Tomb; climbed very partially up the Eiger in Switzerland; got high as a kite off grass in a park in Amsterdam; saw Jersey cows on Jersey island off the English coast; was overwhelmed visiting Le Mont St. Michel, an abbey in the ocean just off the French coast; loved viewing the Kon-Tiki in Oslo and taking the fjord-riddled train ride from Oslo to Bergen. But when I think of “bucket lists now”, those images usually don’t appear much any more. But, every day that God gives me, I can wake up and see Patti smile, my “bucket list” is full … even overflowing. First, folks, I apologize for not posting more frequently. I now have more things to share, so posting will occur, hopefully, more often. There is a song that Country balladeer George Strait sings periodically. It is called “I Saw God Today,” and it is truly a beautiful song that will bring just about everyone to tears. I know I have shed my share of tears when hearing the song. So why am I bringing this song up? Well, I saw God the other day, and I thought I would share my experience with you. On this particular day, Casey and Patti had taken Rick’s truck to pick up some furniture. Our three-month granddaughter, Grayson Mae was riding in her car seat in the back seat of the truck. Casey backed the truck into our driveway and she and Patti were unloading the furniture into the garage. I asked if there was anything I could do to help. Patti told me that Grayson was crying in her car seat and could I please try to soothe her some? I opened the door and saw my granddaughter sitting there in her car seat. There were crystal clear water drops at the edge of her beautiful blue eyes and her mouth was frowning. There may have even been a drop or two beneath her tiny nose; she was upset. I started talking to her in a gentle, quiet voice, almost whispering. I told her what a beautiful young lady she was, how she was going to break a lot of hearts as she grew, that she would be the source of many wonderful memories from those who had the chance to get to know her, again how beautiful she was and repeated a lot of what I had just told her. During these few moments, she kept staring at me, but her expressions kept changing. She stopped crying and for a few moments she seemed to be assessing me. Who was I? Why was I talking the way I was talking? What was I saying? Was I really talking to her? Did I really mean what I was saying? I kept smiling as I spoke to her and after a few minutes I noticed that she no longer cried, but she was smiling … smiling at me. The look on her face left me breathless. I just stood there in awe of the range of emotions I was seeing on her face. I saw the face of God, His Son and the Holy Spirit in that face at that moment. It seemed like every bit of knowledge there was on this earth was showing through those eyes. Immediately, she seemed to exude all the red lines from the Bible and show them without saying a word. I stood there and just watched, my emotions completely overwhelming me as I saw her go from a crying baby to this infinitely radiating beauty who wanted to show just about every emotion at one moment … and she was in control of showing them. I do feel I saw God that day and am so thankful for that chance. I know that for most of us, we see the spirit of God, His Son and the Holy Spirit at work in sometimes every day things. When I am down here at Stagecoach Trails, here in Buda, I can sit on one of the benches and feel I hear God whispering to me through the limbs and leaves of trees, the grasses and the solitude of so very little noise. He mostly whispers, but sometimes He’s laughing, too. Where do you see God speaking to you? The expression “wrapped around her little finger” is not lost on me. But He’s all around us, every moment of every day. Sometimes His presence is in the face of the small, three-month old baby. Sometimes, as I meet people, I inevitably get the question of what it is like to live with stage four pancreatic cancer. Am I angry at God? No. Do I feel like a portion of my life has been taken from me? No. Have my dreams been squelched? Maybe. I can’t play golf any more, but I really don’t care. When I can look into the face of my granddaughter and see the face of God I think that is a good tradeoff. I see beauty in places, things and people that I never would have noticed, had I continued to work, remained under strong work-related stress and looked at things differently than I do now. I am thankful for that. So, I am thankful to God for the blessings and gifts He has given me through the cancer. I don’t think I would have had the opportunity to get reacquainted with my faith had it not been for the cancer diagnosis. I smile every day and am living the life I feel I wanted to live my entire life. And, if I can see the face of God in my granddaughter, Grayson Mae, I don’t think anything can be better than that. On the health side, I am back on chemo, every two weeks. Smaller dosages of gemcitabine and no abraxane. I have lost weight. No appetite or hunger; consequently a little weaker. I use a cane and walker now. But also as the liver begins breaking down, I accumulate more fluids in my lower abdomen. So from the breastbone up I look like an Auschwitz victim, and from the breastbone down, I look like a seven-months pregnant woman. So I go to the hospital periodically and they drain the fluids. I look forward to October 1, 2015. Then, I can join an exclusive club. Since I was diagnosed with the stage four cancer in late September, 2010, I have been dealing with this for over four years. Only six percent of patients are still alive after their fifth anniversary. It’s my goal to thank God again for his blessings and gifts on October 1st. Here is a YouTube video of George Strait’s “I Saw God Today.” I hope you enjoy it. Drop the link below into your URL and it should play. Back in J-school, the first thing we learned was that the lead paragraph should have the who, what, when, where, why and how — or at least as much of those as you can know. Yesterday, my youngest daughter, Casey, and her husband, Rick, had a gender-reveal party at their home to announce that the child they are expecting in March will be a girl, and her name will be Grayson Mae Reed. The two of them really pulled this off well. Ever since they announced they were expecting, friends and family have been asking about the gender and suggesting names — but they never budged. It has been quite exciting. For weeks now, we have been guessing on the gender and supplying suggested names to consider ad infinitum. At the gender-reveal party, guests were asked to wear either blue or pink, depending on whether you thought she was going to have a boy or girl. I wore a white shirt and pink tie. I have thought ever since Casey and Rick announced they were expecting that it was a girl. There was a lot of blue at the party. So, when it was time for the reveal, they brought out a box with balloons in it. After some teasing from the guests, they opened the box to reveal a set of pink balloons. Very cool. Then, the cajoling for the name began. They told us the name and said she would be called Gracie Mae. She will be named after a few members of both sides of the family. Very well done and, for me, truly a beautiful name. I know this appears to be rather matter-of-fact, but it was truly an emotional event. And, sometimes, these events, like a gender-reveal party, are part of something much bigger. I like that. I celebrate that. I revere that. Here’s what I mean. Years ago, when I was a twenty-something living in Houston, I was shaving at the sink in front of the mirror in the bathroom and the radio was playing. I will listening to KILT-FM, a long-time pop/rock station there. Well, they were playing Steely Dan’s hit “Hey 19” just one too many times. At the time, it seemed like every song I heard on the radio was “Hey 19.” So I flipped the station to a country western station and the first song I heard was a Lefty Frizzell and Dottie West hit called, “You’re the Reason God Made Oklahoma.” I loved it. It made me smile. I was smitten. Well, yesterday in the morning of the gender-reveal party, I ran an errand, and on the way back, “You’re the Reason God Made Oklahoma” came on the radio. I smiled, I chuckled and then I did something I have never done ever. I turned the radio up AS LOUD AS IT WOULD GO and let it play. I sang out loud to every syllable. When the song was over, I laughed out loud. For someone born in Oklahoma, it was a truly wonderful moment. While I don’t think my parents had a gender-reveal party when they were expecting me, I have to believe there was just as much enthusiasm among friends and family of my parents as there was later in the evening for Rick and Casey. And, as it turned out, Grayson Mae Reed, has some of my relatives in there, and they were all born in Oklahoma. And, there was an additional occurrence yesterday that had me stopping and thinking. Patti and I have been in our house here in Buda for two years this month. There is a small flower bed in the front of the house that is sustainable. For the first time in two years yesterday, I went out and pulled some weeds, trimmed the bushes and raked up the debris. While I was raking, I stopped a moment to rest. As I stood there, a blue balloon came from out of nowhere and floated across our front yard. It then flew down the street and just kept on going. Knowing we were going to a gender-reveal part in just a couple hours, I stood there and went, “Huh?” As you might imagine, I wondered if this had anything to do with the gender-reveal party, or nothing to do with it. I had been pretty settled in my belief they were having a girl, but the blue balloon could have been a sign, or it could have been nothing. After the party was over later in the evening, I told Patti about the chain of events for that day. We both smiled. I know there is a God that watches over us all the time, and God has a great sense of humor. And I know He will reveal himself in His entirety to Grayson Mae Reed at the right time, and she will be all the better for knowing Him. God bless you all and your family and friends. This is one of the photos that Casey and Rick used to announce to friends and family they are expecting. There is wonderful news on the horizon for the Aldridge-Reed family. Casey, my third daughter, and her husband, Rick, are expecting their first child on March 7, 2014. That day is also Patti’s birthday. This will be my fourth grandchild and the first one for Patti and me. We are very excited for Casey and Rick. Of course, every child is special, including the three who precede this baby for me. Since Casey and Rick first told us the good news, Patti and I have gotten a bit refreshed with some aspects of parenting — like looking at cribs, onesies, finding out what people do for diapers these days. Plus, there are the car seats, changing tables, strollers and “prams.” Just today, Patti and I were walking in downtown Buda, and we saw an old-fashioned English pram for sale. We looked up and down the sidewalk to see if Julie Andrews was going to walk around the corner and try to sell us this pram, it was very English. It was dark, uh, excuse me, British blue and even had a safety seat for extra protection plus over-sized English-style tires/wheels that were like the old English bikes — narrow but sturdy when full. Rick and Casey are thrilled with the beauty of a new baby in early March. Patti and I have given thanks that we’re not the parents, but grandparents. And, that’s as it should be. As humans, we can have our breaths taken away by that stroll on an autumn day underneath a canopy of trees exploding with red, orange, brown and yellow leaves. Or sitting on the rim of the Grand Canyon and watching a beautiful sunset that captures and holds your attention and sprinkles a rainbow of luminescent color that showers you from overhead. Those are beautiful moments and ones we should always treasure for their randomness, but next year there will be green leaves on those trees on that path and the next time you visit the Grand Canyon, it may be overcast. But the beauty that comes with the birth of a child is forever. For years, Patti has entertained me with the theory that God makes babies smell so good, until they are two, by then you have bonded with them and wouldn’t dare give or chase them away … until they are in their late teens and they are messy and begin to stink. Then, you know they are ready to leave the nest. Casey and Rick are already showing those signs of appreciating the beauty before the child is even born. Whenever we see Casey, she tells us where the child is in its development (the baby’s fingerprints start developing today) and then there is strong Rick, who just melts when he talks about his son or daughter. I thank the Lord because these two are seeing the unique and forever beauty of their child, and he or she has not even graced us with his/her presence. I pray that every person who becomes a parent finds that wonderful opportunity to soak up that special beauty.